We’re becoming like the locals here cathing the busses and trains like we actually know what we are doing. 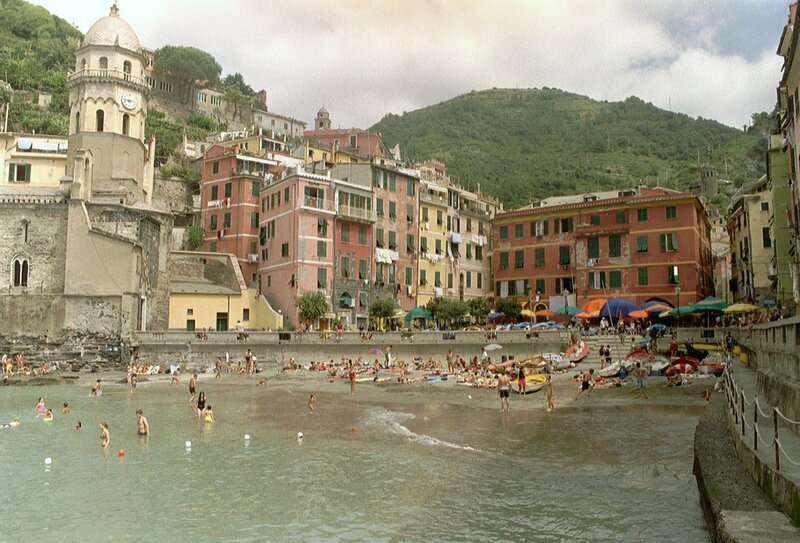 We decided to take the train to Vernazza today, spend some time there and then hike the trail back to Corniglia. 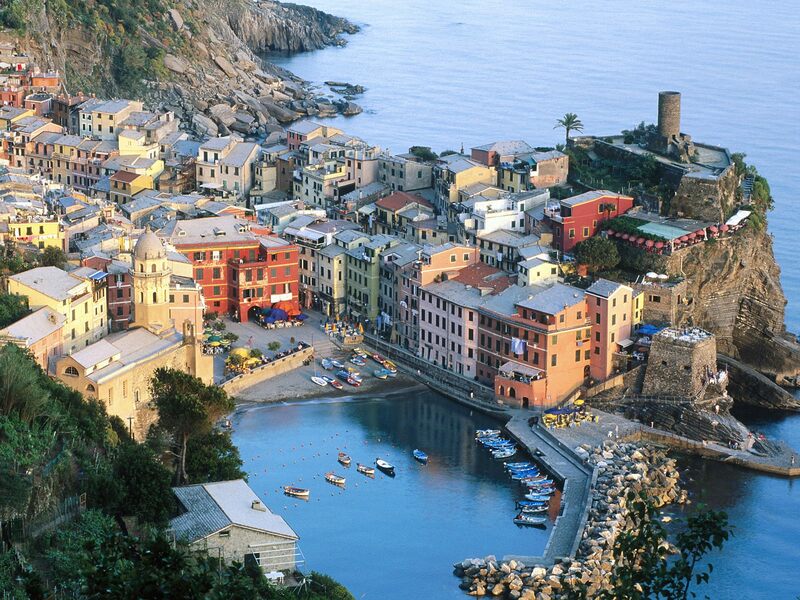 Again, Vernazza is a great little seaside village with a castle that you can walk up to for some terrific views. Found the perfect restaurant up there with the perfect view. Can’t say enough about the food here. The Regional dishes are delicious and despite all the hiking, fear that I may have put on a few pounds. 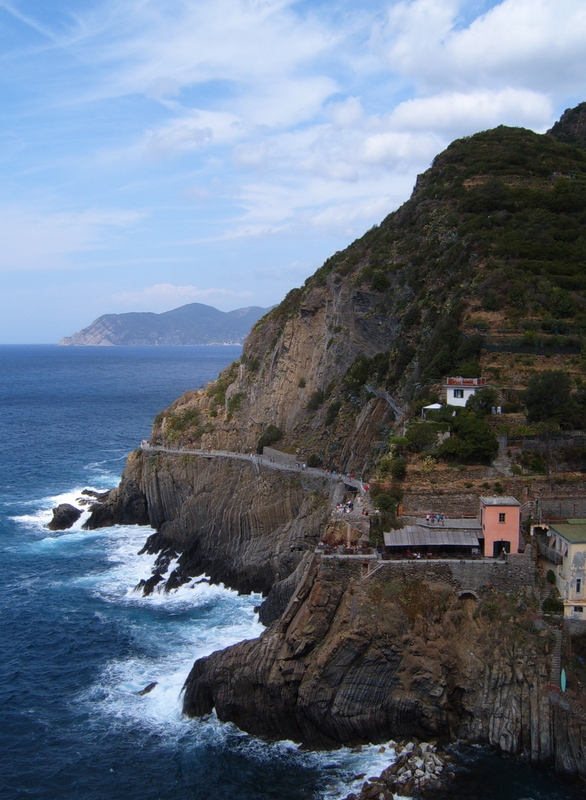 The hike between Vernazza and Corniglia was the toughest hike so far, going high into the hills. 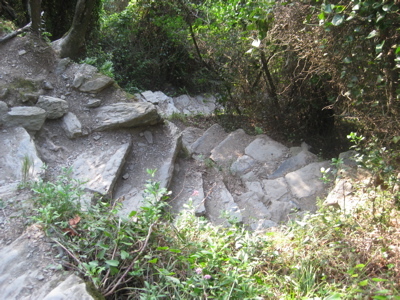 Unfortunately, the trail between Vernazza and Monterosso is currently closed because of a slide and that puts more pressure on the other trails. As a result, it was sometimes difficult to pass on the trails as it can be very narrow in places. Still, a great hike and there was a little bar about half way with amazing views of Corniglia. After the hike, we jumped on the train to Monterosso. This is not only another fabulous traditional village, but also a beach resort and with the beautiful weather we are having, it was very busy and very popular with the younger crowd. More sightseeing enjoying the ambiance of the village and then the best bruschetta I’ve ever had before taking the train back to La Spezia. 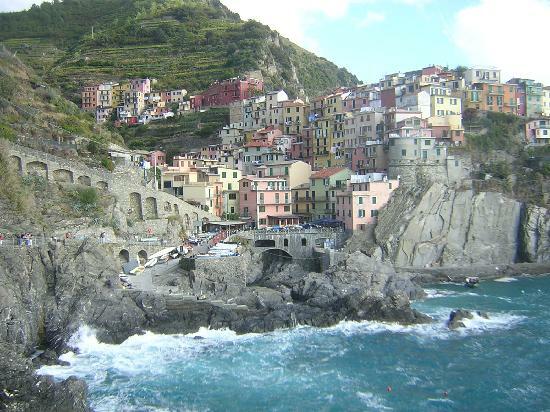 Another wonderful day in the Cinque Terre! We started the day in Monarola and took the trail to Corniglia. A relatively easy hike of a little over an hour, again very picturesque along the seaside. The most difficult part was the 382 sairs from where the trail is, up to the town. 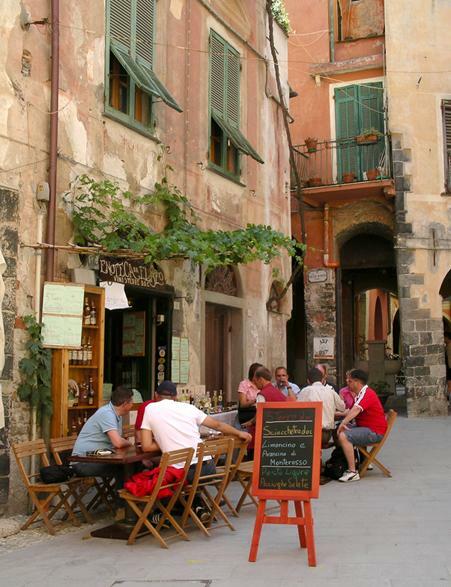 It is another very charming town with many narrow, winding streets with little bars, restaurants and shops caering to the tourists. We are finding the trails quite busy as we are well into tourist season. Prices are what we expected and you pay 12 to 15 Euro per person for lunch but you could easily pick up a panini or a pizza for about 1/2 of that. A litre of house wine is usually about 9 Euro. 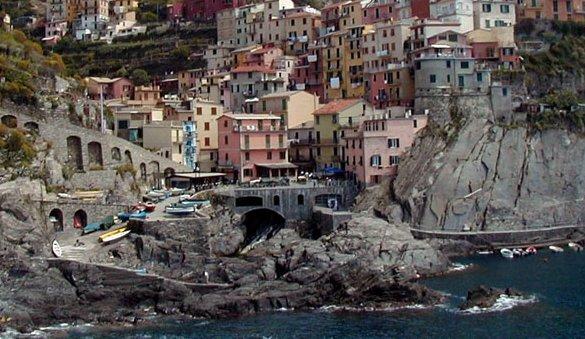 It’s easy to relax and spend the day strolling around these charming towns but we see lots of people hurriedly trying to fit all of the Cinque Terre into a couple of days. While most people may only have a short stay here, my suggestions would be to pick a couple or three of the towns and enjoy the experience! 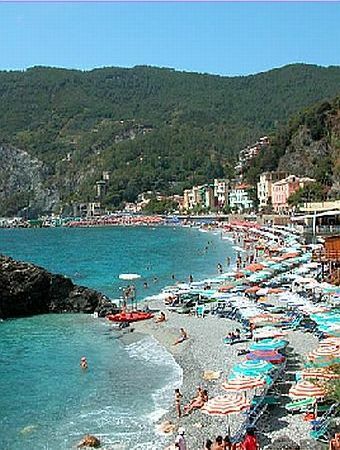 Cinque Terre pass for 39 Euro for both of us. This includes 3 consecutive days of using the trails and unlimited use of the train. 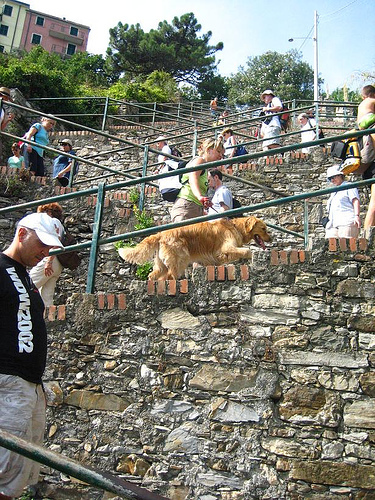 We took the train from La Spezia to riomaggiore and then walked to Manorola. Often called Lover’s Lane, this was more of a stroll than a hike but the trail was along the cliffs and the views were spectacular. After lunch and some time in town, we bought some wine, cheese, bread, olives and salami for dinner at our B&B as we watched the sunset from our balcony…very relaxing. The train from Rome to La Spezia was easy and relaxing after all the walking in Rome. It truly is a great city to see and walking is just part of the enjoyment. Arriving in La Spezia, the plan was to take the bus up (and I do mean up) to Campiglia where our accommodation was a bed and breakfast. Unfortunately, we missed the bus by some 15 minutes , so we grabbed a taxi. The fare was not too bad (5 Euro) and it took about 20 minutes. Campiglia is at the very south end of the Cinque Terra – in fact, the National Park started about 100 meters before our accommodation. It is a very, very small village (imagine a one street touwn abour 4 blocks long) but it does have 2 restaurants and 1 small “bar”. 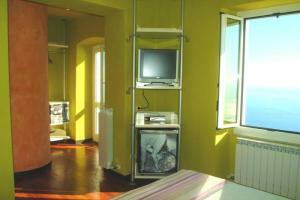 The PiccoloBlu is a 3 room bed and breakfast with spectacular views of the sea. We chose this spot because we have a wonderful, albeit small, balcony over looking the sea. This morning we hit the Cinque Terra Trail leaving right from our B&B with the idea of reaching Riomaggiore around lnch time. 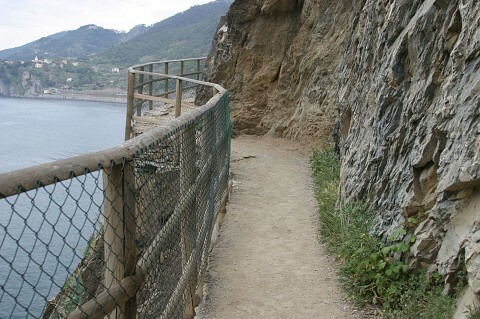 The trail leads us along the top of the cliff and was pretty good although quite steep and narrow in some places. Through the forest and along steeply terraced vineyards, we were literally the only ones on this part of the trail as it is often overlooked by most tourists. It s relatively well marked except for one section that sent us off in another direction and caused about an hour delay…I really should have listened to my wife earlier! 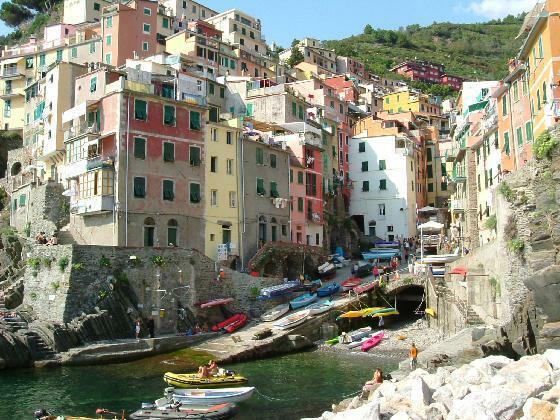 None the less, Riomaggiore is a wonderful small fishing village and a great way to experience Italian costal living. 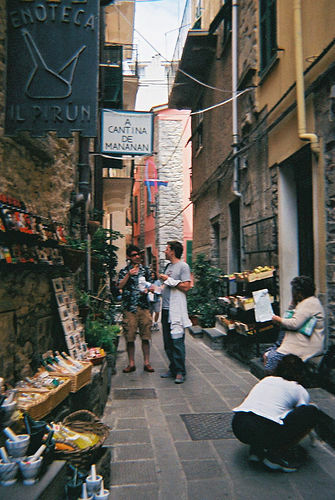 Several restaurants, a couple of small groceries and a few tourist shops along with these great old houses/apartments and it is quaint, the atmosphere is so wonderful…so Italian. Need to go now as the village church bells are reminding us, it’s supper time! After a wonderful flight with Air Canada (who knew I would like the Alice in Wonderland movie with Johnny Dep), we arrived in Rome. Our first thought was to take the train from the airport to downtown, since our hotel was only a few blocks from Termini Station. However, we were approached by a guy trying to fill his shuttle van and the selling point was that, for only a couple of Euro more, he would deliver us to the door of our hotel. That appealed to me and for 30 Euro, we got to see some of the sights and were dropped off within a half block of the hotel…not bad and it was better than the train, which we had taken before. Thanks to adrienne in our office who booked us at the Best Western Hotel Mondial thrTransat Holidays. A great location and a pretty good hotel with a really good breakfast included. My rule of thumb for International travel is to stay up as late as possible on your first night to help overcome jet lag. However, I’m sure that we walked half of Rome seeing some of the sights such as Piazza Venezia, Ill Vitroriano and the Pantheon. After a couple of hours over a leisurely lunch in Piazza Nvona (a great piazza with lots of outdoor restaurants, entertainers, fountains and many artists) we walked back to the hotel and were completely exhausted. All this by 7:30PM. So much for staying up as late as possible but by 3:00am…wide awake. 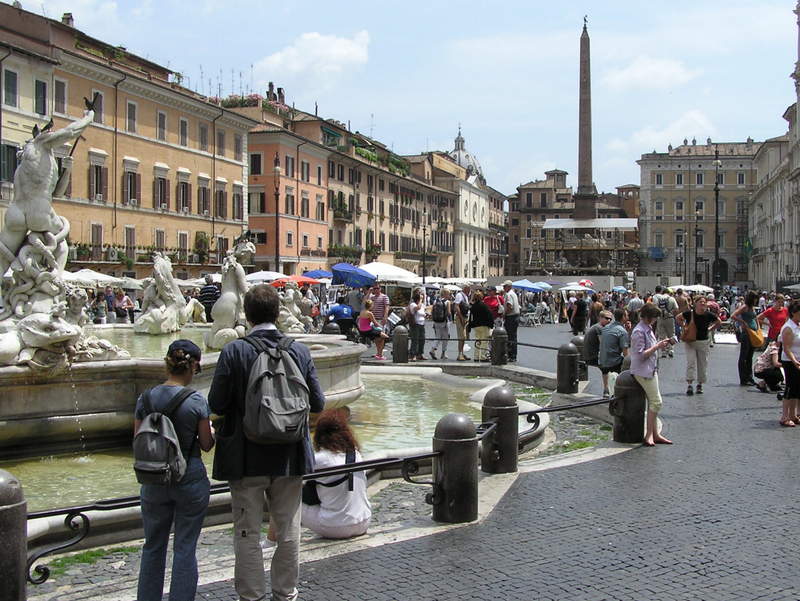 Thursday morning we took advantage of the wonderful hotel breakfast and hit the streets again taking in The Spanish Steps and Piazza di Spagna, Piazza del Popola and some time in Vatian City. 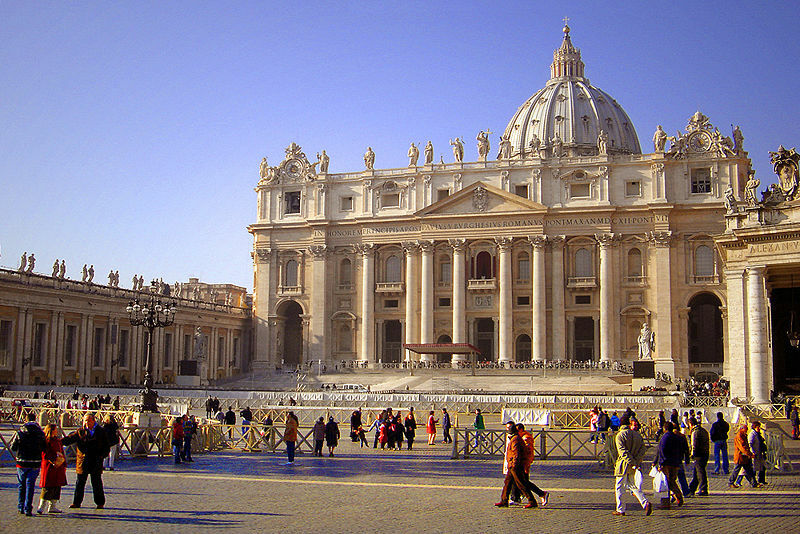 Having been to Rome before, we had been inside St Peters Basilica and the Vatican Museums. My advice is to book guided tours for these sights or you will be spending literally hours in line ups. The line just to get inside St Peters was 2 hours long alone. The Vatican Museums and the Sistine Chapel were at least that long again. The tour groups are able to bypass these lines. After lunch, we were off to the Stazione Termini for our train to La Spezia for our next adventure. Please note: My Blackberry failed me on this trip and these blogs are being published now that we have reurned. Yesterday (June 11th) was King Kamehameha’s birthday. There was a big street party with vendors and performers and today there was a parade and other festivities. All of this means that Waikiki is EXTREMELY busy this weekend! There is so much to do! I was up bright and early this morning and checked out of the Marriott to go down to see the Parade. It was very interesting to see all of the different royalty from the different islands all coming out to be a part of the parade. I spent my afternoon by the pool and just enjoying the Marriott. Then I came down to the Waikiki Gateway hotel for my final night. Boy do I miss the Marriott! This will do for tonight though, of course when it comes down to it, money talks and this was an affordable option. I would compare this property to a hostel type of environment. It’s about 4 blocks to the beach but is in a good area — just a block away from the major high end shopping. This evening I had a lot of alone time. After spending some time on the beach with my new friend Dalin I wandered through some stores and into the Waikiki Shopping Plaza to grab some food court supper. To my surprise, the shopping plaza was actually 5 levels of fun! It’s full of random little gift shops, a lot of stores selling Hawaiian quilts which are beautiful, jewellery stores and some high end shopping. On the 3rd floor there is a 3D mini-golf course which looks very fun for a rainy day or if you just need to get out of the sun for a while. Tonight there was a speed eating contest happening on the main level. It was a fun distraction for a bit. They had to eat WAY too much food in my opinion. During the contest they also mentioned that they offer free Hula lessons every day at 10am and 12noon! I am planning to stop by there tomorrow and check that out. They also have yoga lessons. This is definitely a place I recommend checking out if you need to spend some time out of the sun. There seems to be a bit of free or fairly cheap entertainment available which is always a nice treat! Because I had WAY more sun this week than my body really appreciates, I plan to spend most of tomorrow just shopping and buzzing around. Plus of course my hula lesson! My hotel has a 24hr courtesy room so I will be able to come back and shower before my flight which is nice. There was a surfing competition on the beach today. If it’s still going on tomorrow I will spend as much time as I can stand on the beach watching that! Then I’ll just head back here for a shower before my flight. I’m writing from my lanai eating my cheese, fruit and crackers compliments of the Marriott. What nice folks here at the Marriott. This hotel is absolutely amazing! And right across from the international market place! Well, both yesterday and today were completely amazing days. We were up bright and early to check out of the Ilikai yesterday morning then traveled all the way across the island to Turtle Bay. Turtle bay is the resort where they filmed Forgetting Sarah Marshal and it is gorgeous! We toured the property then went horseback riding on the beach. I remembered that I really don’t like horseback riding… but I was already on the horse so there was nothing I could do. It was beautiful and I’m sure very peaceful if I wasn’t completely TERRIFIED of the horse. We saw where they were starting to build a set for a new movie… I can’t tell you what one or who is in it though. 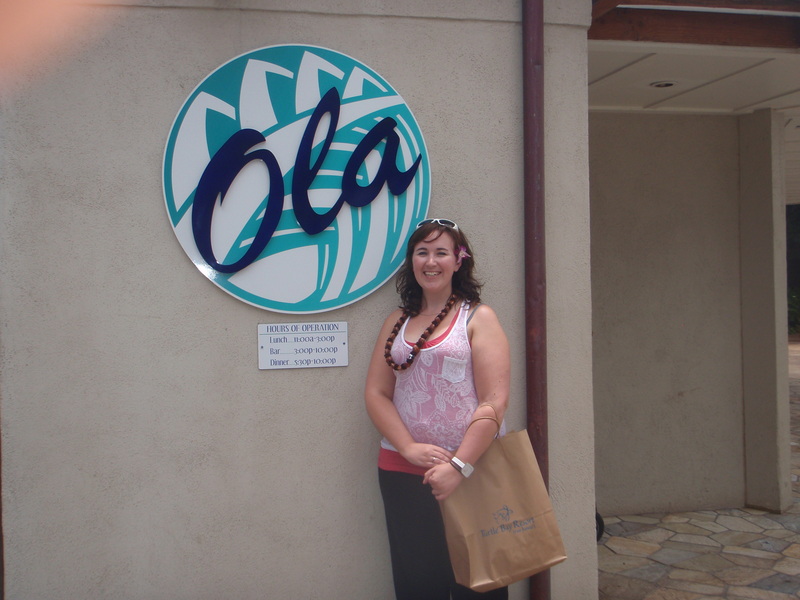 Then we had lunch at Olas which is the restaurant from, you guessed it, Forgetting Sarah Marshal! I am not typically so star struck, especially by something that is not even a star… but I was pretty excited about all of this Forgetting Sarah Marshal stuff. After we were done at Turtle Bay we ventured on to Dillingham Airfield to learn about Glider Rides which is a really cool thing for the adventurous types. It’s basically these planes that are propelled almost entirely by wind and you go up and can get amazing views of the island with a visibility of 30-40 miles. The man who ran the company was super cool and has been doing it for years. We also visited a polo field and learned about the history of the game in Hawaii. Polo matches are held on Sundays and would be a really neat thing to see if you’re looking for something different. From there we went to Waimea Valley to learn about the history of the Hawaiian ancestors and the nature preserve in the valley. All in all, it was an amazing day! Today we were in the lobby by 7:15am which is earlier than I consider getting out of bed at home; this was to get on the bus to Waianae Harbor. We went on a cruise with Wild Side Specialty Tours, they took us to see the Hawaiian Spinner Dolphins — we even got to swim with them! It was amazing to see these animals out in the wild and to get so close to them. They’re smaller than the dolphins we see on TV or typically think of but they were beautiful and so playful! Then we moved to a reef and snorkeled a bit more. We saw a Green Sea Turtle cleansing station which was by far the highlight of my LIFE! I was completely mesmerized by these beautiful turtles just chilling out at the “Spa” as the fish cleaned all of the algae and barnacles off of them. I just can’t believe it yet! We also went to Wet & Wild, a water park here on Oahu. It was pretty cool but not really my thing. I did go down one slide with a group of agents and Stacey’s son. It was TERRIFYING. It is defiantly an excellent place to take kids though! From there we did some more site inspections then arrived back at the Marriott to be greeted with our special treats! I’m going to finish watching the sunset now and then find some supper and off to bed. Tomorrow is another early morning, we have to help the University conserve wildlife and visit a ton of beaches… work work work! Oh, and by the way, if it does not stop raining at home, I’m not coming home.